Dr. Arya Edalat’s keen attention to detail, exceptional manual dexterity and quest for perfection has made him outstanding in the art of general and cosmetic dentistry. His creative and innate artistic nature enables him to treat complex cases with the patience and knowledge required to consistently produce optimal results and to make his patients feel confident during the treatment. After receiving a B.A. in Biology from New York University undergraduate program, Dr. Edalat continued at New York University College of Dentistry where he graduated as Doctor of Dental Surgery in 1994. 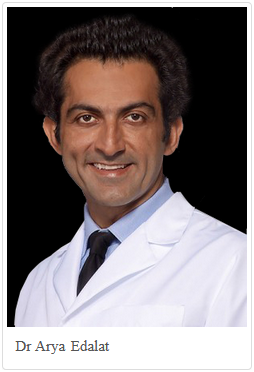 From 1996-1998 he completed specialty courses in cosmetic and implant dentistry at NYU. The post graduate courses in Implant dentistry included both phases of treatment, the surgical placement of implants as well as the prosthetic restoration of implants, which provided him with a more comprehensive knowledge and experience of the field. Since then, he has been in private practice on Central Park South along with his father Dr. Parviz Edalat (Periodontist & Prosthodontist) and his sister Dr. Maryam Edalat (Periodontist and Invisalign Orthodontist). In 2010 he established a general and cosmetic dental practice in the state of São Paulo, Brazil where he treats his Brazilian patients with cutting edge techniques and dental materials brought from the U.S and Germany. Currently Dr. Edalat is attending patients in his New York and Brazil office throughout the year. Dr. Edalat practices a biomimetic treatment philosophy which involves using conservative dental treatments as the first approach along with dental material which mimic closely the structure of natural teeth. He also educates his patients to practice prevention and follow an anti-inflammatory diet to maintain optimal oral and systemic health throughout their lives. His reputation as a professional who is serious, competent, dedicated and above all Humane is what a lot of his patients value most. His goal is to make high-end dentistry accessible to the majority of the population despite their financial situation. Through flexible payment plans established on an individual basis and offering all the alternative treatment options which may best suit each unique individual.